You’ve done the research and you know you need to incorporate social sharing into your event planning. Today, attendees expect activity feeds and social walls to be part of your event and to mirror some of the social apps they use daily. You can accentuate these benefits when you display your event app’s feed on large monitors around your venue, and allow everyone to see the great content from your event. Set up a social wall at your next event. Let your attendees know ahead of time that you will have social sharing, and inform them of your hashtag. Display monitors featuring live feeds around your event venue and display your hashtag on all your promotional material. Let your attendees have fun with their social sharing. Encourage them to post content about their experiences and share pictures of the fun they’re having. 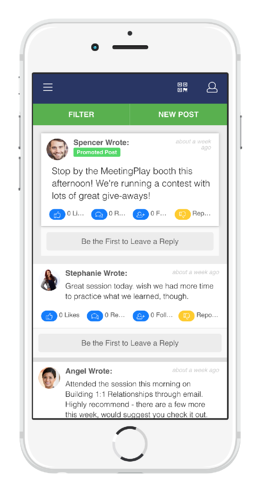 You can even incorporate event gamification activities into your event to drive interaction on your feed. Activity feeds are a great source of marketing content, created by your target demographic in real time. After your event, you can pull images, comments, and testimonials from your feed to use as marketing material for your business. Create a presentation or portfolio for your internal marketing campaigns and showcase the popularity of your event. Vendors and sponsors can post on your activity feed to create awareness for their products or services. As the event planner, you can also personally promote them on your activity feed and highlight their business and logo on your social walls. If you want to drive even more to your business partners, use your activity feed and event gamification features to create polls about your vendors and sponsors. Social sharing is a powerful tool that can add value and entertainment to your next event. But don’t settle for entertainment alone. Put social walls and activity feeds to work for your business. Use the attention they generate to improve your events and add value to your vendors and sponsors. Contact us to discuss the specifics of your next event. We’ll work with you to customize your content and help you reach your event goals.